The Flags of the World graphics library is the perfect resource for all the clip art graphic content you need to create your cards, posters, invitations and personal documents. Including over 200 unique flags for the different countries of the world, not only that but with 3 different styles the library has many uses. With the different styles included in this library you can use the flags as icons, buttons and graphics for web, game and any other interactive content. It is only $4.99/£2.99!! And can be used on OS 10.6 and above, on ANY MAc OSX application! We had fun making it, so you’ll definitely enjoy using it for all your flag needs! Happy St. Davids Day everyone! Did you know, our Seasonal Library contains some gorgeous graphics to help you celebrate St. David’s Day? Check it out! It’s only £6.99 ($9.99) and we are updating it for FREE for every major holiday in the coming year. And if you haven’t already, check out our other products on our site www.microspot.com! 10% discount on all Microspot Products!! To celebrate this period of giving, Microspot is offering 10% discount on all Microspot Products, using the coupon code 10VAL13 valid until February 28th 2013!! Check out our Facebook too! Give Something Special This Valentines Day! What can these library items do for you? The Seasonal graphics library is the perfect resource for all the clip art graphic content you need to create your cards, posters, invitations and personal documents during those key periods of the year. What’s more is that the library is continuously being updated with new content as the seasonal periods arrive. Version 1 of the library included over 120 items for the christmas and new year period. We have now updated the library with 120 items for Valentines day, Mothers day, Lent, Chinese New Year and Patron Saints and yes the updates are FREE. Simply that means the Seasonal Library now contains over 240 items for December 2012, January, Feburary and March 2013. Version 1: Included over 120 clip art graphics for Christmas and the New Year. Version 1.1: Includes 120 additional clip art graphics for Valentines day, Mothers day, Lent, Chinese New Year and Patron Saints as a FREE update. Look forward to more FREE updates as the new seasonal months arrive. Fully scalable, vector drawn and editable clip art graphics. Search for items using the find feature. Export to Illustrator, PDF and other image formats. Control the preview thumbnail size with the zoom slider. Creating a picture frame effect, where images can be dragged behind and show through the frame? This can only be done using MacDraft Professional as it uses the Accessory palette which is not available in the Personal Edition. However both Pro and PE have templates that were shipped with version 6, which have these picture frame effects in them. They are in the greetings card section of the templates folder that came with the application. The following will explain how to create the Picture Frame effect. 1. Draw a rectangle 2 inches high and 1 inch wide. 2. 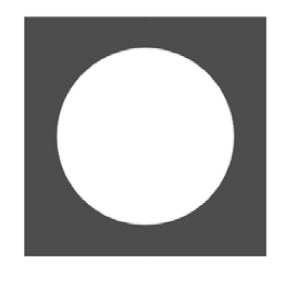 Select the Circle by Radius tool and draw one in the center of the rectangle as shown opposite. 3. Now select the circle and the rectangle and open the Accessory palette from the window menu. 4. with the two shapes selected click the Subtract Parts tool in the Accessory palette. 5. You will see that the circle remains, this will help to create a border inside the frame. 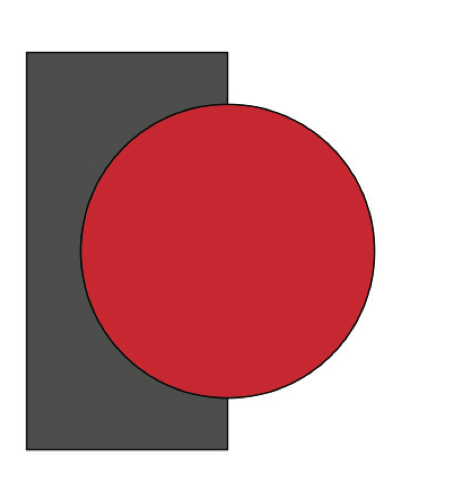 Make the circle have a no fill color and a pen color of white. 6. Select the rectangle and duplicate it, then flip it horizontally and align it next to the other. Make sure the line color of the rectangles are the same as the fill color. Now drag the image and resize it, then send it behind the frame you have just created. You now have a picture frame effect. How do I create a shadow effect on my designs? At this time MacDraft does not offer the drop shadow or glow effects, this is something we are looking to include in future versions. However despite this you can create a shadow effect as shown in the above image, and give the illusion of a drop shadow. When you have drawn the shape or object that you want to apply a shadow to, duplicate it so that you have a direct copy of it. Now because it will be a shadow you are creating, we no longer need the detail on the copy. Select the copy, and change the fill color of it to a light gray. Now change the pen color to either the same as the fill color or set it to none. You will notice that the copy now has a kind of silhouette shadow effect. The final thing that you need to do is change its size so that it can be positioned correctly. Resize it depending on the shadow you are creating. If you want a shadow with an offset like the image above then the size needs to remain the same. 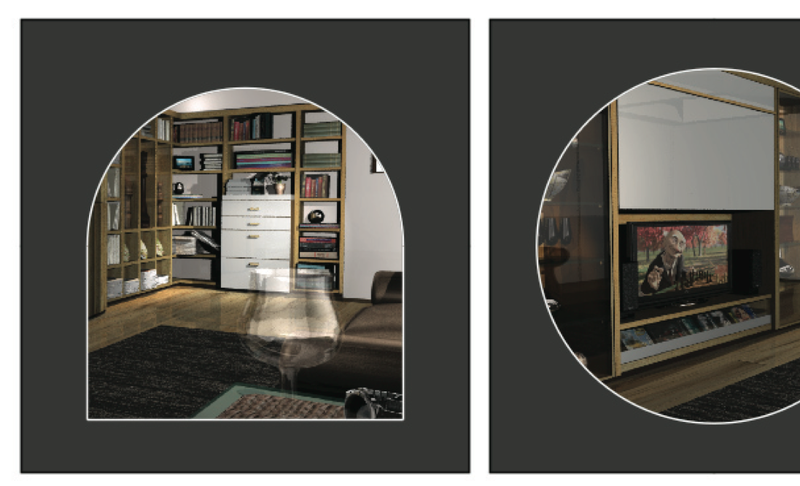 If you want the shadow to be directly underneath then adjust the size to suit the lighting effect you want to create. Can I get back to the Arrow tool when drawing without going to the Tool palette? Simple Click Does = Start Drawing Object: Double click the mouse button. Simple Click Does = Select Arrow Tool: Single click the mouse button. How do I drag an item to the Library palette? Hold down the Command key while you are dragging the item to the Library. The reason we have done this is because if you drag an item without the command key it automatically scrolls the document. My Library has gone missing from the Library palette, how can I get it back? Locate the place where your library is on your computer in the Finder, then drag it to the MacDraft Library palette. To drag it to the Library palette you will need to make MacDraft the active window while dragging. To do this drag the item, while holding the mouse button to drag, click the F9 key, then while still holding the mouse key down move the cursor to the MacDraft window and click the F9 key again. Then move the cursor to the library palette and release the mouse button to place the library. Go to the Library palette and click the gear symbol in the bottom left hand corner. Select Open Library from the pop-up menu. An Open dialog appears, locate your library and click the Open button. I have a common set of items that I use in my drawings, that are not your typical symbols. What’s the best way for me to store these items in MacDraft? Get all of the items that you want to use in one document. (This will speed up the creation of a Library). Go to the Library palette and at the bottom left of the palette, click the gear symbol. In the pop-up that appears, select the New Library option. A Save dialog will appear. Give the Library a name and a destination to save it to and click Save (Save your libraries somewhere easy to locate. Maybe create a folder on your desktop called My MacDraft Libraries). The new library will appear in the library palette. Make sure the new library is selected and drag the items you want into the library window.